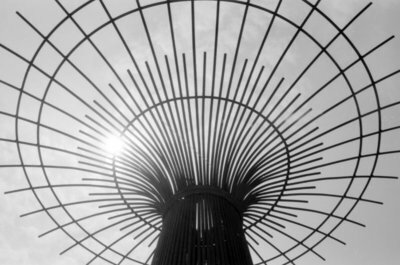 A black and white photograph of the wheat sheaf sculpture in Brooklin Landmark Square. Brooklin Landmark Square is located at the southeast corner of Winchester Road and Baldwin Street. The large sculpture in the centre of the square is made of reinforced rods representing a wheat sheaf to celebrate Brooklin's agricultural heritage. The square was made possible by a generous donation of land and funds from Roy and Thelma Ormiston as well as other donors. Brooklin Landmark Square, June 17, 2006, Carl Ferencz. Whitby Archives A2013_019_007A.